FLIR K-Series cameras are high-resolution thermal imagers, specifically designed for the extreme heat and smoky conditions that firefighters encounter. Both the K40 and K50 offer a bright LCD display for superior visibility, simple operation, image storage, and easy toggling between five imaging modes to optimize sensitivity for higher or lower temperature ranges, including search and rescue (SAR) and hotspot detection. The FLIR ONE, on the other hand, is a lightweight accessory that transforms an iPhone 5 or 5s into a thermal imager that is able to detect and display invisible heat energy. For firefighters, this adds situational awareness capabilities to a smart phone platform. While the FLIR ONE is not designed to be used in the extreme temperature environments found inside burning structures, it has the potential to be helpful for scanning exteriors for hotspots during the overhaul phase, detecting heat signatures during outdoor rescue efforts, and as a fire prevention inspection tool. 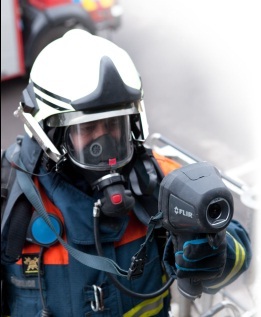 With the value-added offer of a FLIR One with the purchase of a K-Series camera, FLIR is providing firefighters two complementary thermal imaging solutions. For more information on the K-Series special promotion, please visit www.flir.com/k-seriesoffer.